Friday March 25 Rodeo at 5:00 p.m.
Saturday March 26 Rodeo at 11:00 a.m.
Sunday March 27 Rodeo at 10:00 a.m. So what happens when your son separates a shoulder in October and you take the winter off from rodeo. Well since you don't help the kids practice or keep the horses in shape, you get out of shape. You gain weight. You start to hibernate. Winter in Utah is not friendly. So you go out to shovel wet heavy 12 inches of snow. What happens to your out of shape body? Well you end up hurting yourself. I have a twisted SI joint and a torn abdominal muscles down by my groin. Can you say ouch? Yeah I have not really been out for 3 weeks. Going to work seems to be all I can manage. Thanks to the chiropractor I am improving. The moral to this story is you have to stay in shape even when your kids are not practicing. Get out there and get some horses rode and keep moving. 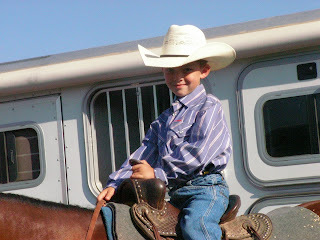 One of the best roping clinics I have ever taken my son to was the Joe Beaver tie down school. It was held in Utah last May. The kids worked really hard the whole time we were there but I was amazed at the personal interested he took in each one. I was completely surprised when we ran into him 7 months later and the NFR and he remembered my son's name and about the school. Saturday 10 a.m. to 7:00 p.m.